When the demon Bauer learns that the only was his lord, The First Of The Fallen, can be returned to his throne is by having the most hated man on earth give his soul willing to hell, he immediately sets his sights on the gent in question - John Constantine. Owed an unpaid debt by Nergal, Bauer is able to use the fact that the now destroyed demon's blood still runs in John's veins as a legal loophole to pass the debt onto Constantine. Possessing a child born to two of John's friends, Bauer insists that Constantine willingly give his soul to hell or he'll take that of the child in payment for Nergal's debt. Backed into a corner, John pulls off a powerful piece of magic, transferring the dark essence of his soul (along with his love of Kit Ryan) into the body of Aleister Crowley, merging the two together to form a demonic version of himself. Bauer is horrified at John's deceit but is unable to stop the Demonic Constantine from giving itself willingly to hell. John's magic was well worked, with the unfortunate Aleister Crowley suffering the torments of hell while the Demon Constantine wanders the pits unhindered, free to explore and exploit its unique position. Well worked, that is, from the Demon Constantine's perspective. John's mucking about with the natural order of things left him adrift in the world, unable to anchor himself without the nasty parts of his self that he'd sent to hell. Constantine travelled into hell for a meeting with his demonic counterpart where he tried to convince him that they should reunite - much to the amusement of his demon self. The Demon Constantine explained that he had the run of hell - he could smoke, drink and taunt the First till the end of time if the mood so took him. He had no interest in getting back together with John but he did set him on the path to finding himself. Things took a considerable turn for the worse when the succubus Ellie targeted the Demon Constantine in a plan aimed at bringing his namesake low. Ellie managed to break Crowley's soul free, leaving the Demon Constantine to experience the true pain and terror of hell. The Demon approached John in his own bid to have the two merge but this time it was the original Constantine who did the turning down. John eventually struck a deal with the devil which saw the Demon Constantine returned to his untouchable status in hell. Recently, John Constantine, who's been suffering from Amnesia, has been having nightmares about the Demon Constantine. #95 - The Demon Constantine's first appearance. 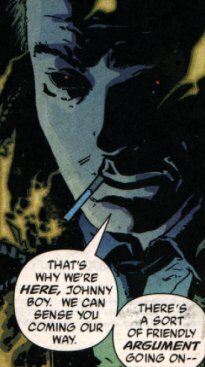 #104 - John Constantine travels to hell but finds his demon self unwilling to get back together with him. #126 - Separated from Crowley, the Demon Constantine seeks out John with cap in hand. #126 - Back in hell, the Demon Constantine enjoys the return of the status quo. #195 - Suffering from Amnesia, John dreams of the Demon Constantine. 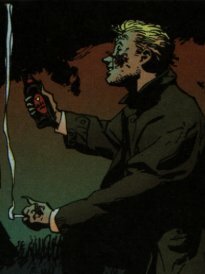 The Demon Constantine enjoys a cig and a beer in the depths of hell. John dreams of the Demon.